As you get ready for that second glass of eggnog, remember the poor independent videogame developer who tried to place a videogame under your holiday tree. 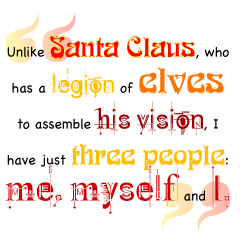 Unlike Santa Claus, who has a legion of elves to assemble his vision, I have just three people: me, myself and I. Life as a one-man videogame shop isn't a world of hot cocoa, candy canes and gingerbread men; it's one of hard work and a touch of futility. And maybe a bit of insanity. Nevertheless, I set out to release a game during the biggest retail season of the year. The holidays are when big game companies - and big companies in general - deploy the big guns. Game companies spare no expense on developing and marketing the games they sell this time of year. So how does the little guy compete in this maelstrom? My first step was to determine my operating budget. I emptied my pockets and overturned the change jar on my desk. When I finished counting, I calculated my budget at $1,000, roughly EA's weekly latte allowance. Ten Ben Franklins don't go very far in a large software company, but the same money in the hands of a skilled one-man shop can go quite a ways. It would be a waste to try and compete against big-box games on sale at huge retailers. No retail store in its right mind is going to give away premium shelf space to a self-published game. About the only place an independent developer can compete is in the casual game market. A casual game needs to be inexpensive and easy to play, provide lots of positive reinforcement, and be playable in short bursts. None of these criteria really scared me. However, the casual gaming market is getting crowded, and I needed a hook to make my game stand out. I needed to capitalize on free opportunities. Somehow I couldn't imagine George Lucas letting me use his Star Wars characters on a contingency basis. Luckily, there are some pieces of premium intellectual property in the public domain. One in particular would also appeal to women, grandmothers and small children, all of which fit into the casual demographic: Santa Claus! Who better to represent a holiday game title than good ol' Saint Nick? Since Santa is in the public domain, "SantaCorp" won't have lawyers showing up at my door looking for its cut. And since Christmas songs are also in the public domain the recording industry won't be blowing down my door like the big bad wolf either. One particular play style stuck out in my mind: Breakout. Of course, plain old, garden variety Breakout wasn't going to cut it. Instead, I needed something that seamlessly integrated with a holiday theme and offered a twist on very tired gameplay mechanics. I mocked up a game screen in Photoshop. Ornaments would be used instead of a ball. I used Christmas decorations instead of bricks, an elf with a sleigh would substitute for a paddle and Santa Claus would be supervising the entire operation as an interactive avatar. The gameplay would be enhanced, as well. I planned on making over 100 levels, and each level would have unlockable bonus objects (like a multi-ball session, a bonus mode or an extra life) in addition to ornaments to break. Certain bricks would cause the game to react positively to the player's progress. Santa would be riding up and down on an elevator, tossing out bonus objects and spouting one-liners at the player. Now all I needed was graphics and an engine on which to run them. I needed to hire an artist, someone who wasn't going to break my piggy bank. A few quick phone calls later, I learned that any professional artist was going to charge me in the thousands for rendered 3-D art, character design and background screens. So for the hell of it, I offered one artist 50 percent of any revenue the game brought in. Eureka! I had an artist, or so I thought.